Make like No-Face and scarf the countless treats of Jiufen. If you’ve ever wanted to live inside Japanese filmmaker Hayao Miyazaki’s imagination, the first thing you should consider is booking a plane ticket to Taiwan. Southeast of China and southwest of Japan, and covered in endless stretches of lush tropical forests and densely packed yet alarmingly clean modern cities, Taiwan served as the inspiration for Hayao Miyazaki’s beloved 2001 film Spirited Away. And if you want to relive it, all you have to do is retrace Chihiro’s steps. Hop on a bus (or taxi) just outside of Taipei’s city limits. As you barrel toward the uneven edges of the island’s northeast shore, close to an hour outside of the city, you’ll be dropped at the base of a small mountain—at Jiufen. While to many anime geeks and general film enthusiasts, Jiufen is best known as the inspiration for Miyazaki’s Spirited Away, to food obsessives, it’s an eating destination. For those unacquainted, Hayao Miyazaki is the Japanese animator, writer, director, producer, and generally genius filmmaker whose work with Studio Ghibli has resulted in some of the most creative and influential animated films of the last few decades: Princess Mononoke, My Neighbor Totoro, The Wind Rises, and Spirited Away, among many others. Spirited Away, released in 2001, is Japan’s highest-grossing film of all time, and won that year’s Academy Award for Best Animated Feature. It tells the story of a ten-year-old girl named Chihiro who, while moving to a new neighborhood with her parents, finds herself trapped in a spirit world outsmarting a witch named Yubaba, who casts a spell on her parents and turns them into pigs. In order to save her family, Chihiro labors away at Yubaba’s bathhouse, a spa for wacky spirits, all the while devising a plan and paying her debts until she can collect her parents and return them to the life they once led in the human world. The setting is the mountain village of Jiufen—home to nine families during the Qing dynasty, and named for the nine portions villagers were expected to bring back from long trips to markets at the base—has gold in its hills. So much gold, in fact, that Jiufen was the center of a gold rush that lasted from 1893 to 1971. The mountain village’s inns and buildings remain largely intact from its peak during the time of Japanese occupation, which began in 1895. You’ll start right where Spirited Away‘s Chihiro starts. Jiufen is oriented vertically. There are a few main streets that run parallel to one another, Jiufen Old Street being the most popular, which—chutes and ladders-style—are connected to one-another by steep 100-stair flights that run perpendicular to these main drags. The streets are winding and paved with cobblestones; they are so narrow and the buildings hug so close together that little light makes it down to the pavement. Lined with magnificent red lanterns, Jiufen is now a one-stop Taiwanese snack mecca, glutted with food stalls serving traditional treats such as taro balls at Grandma Lai’s Yuyuan, tea eggs, and pineapple cake. The sounds of heckling vendors and smells of cooking food fill the limited space between the buildings. Every once in a while, there are clearings; that’s when you can see exposed views of rolling mountains, covered in thick, deep-green forests, and the blue waters of the East China Sea washing up along sandy beaches in the distance. Jiufen is isolated, mysterious, and exceptionally beautiful. The food in Spirited Away is animated with intricate detail. 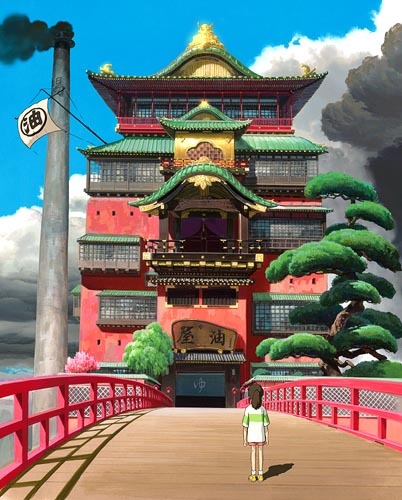 Some of it is Japanese: Chihiro noshes on onigiri (rice balls) with her parents; Lin feeds konpeito(traditional, brightly colored Japanese sugar candies) to the animate soot balls; and even ishi-yaki-imo (stone-roasted sweet potatoes) appear on screen. But most of the good stuff is Taiwanese. Trudge to the top of Jiufen, a climb that will make your quads burn just enough to prepare you to chow down. As you make the turn onto Jishan Street, you’ll lose much of the natural light from the sky as awnings converge to form a makeshift ceiling. This is where you eat. 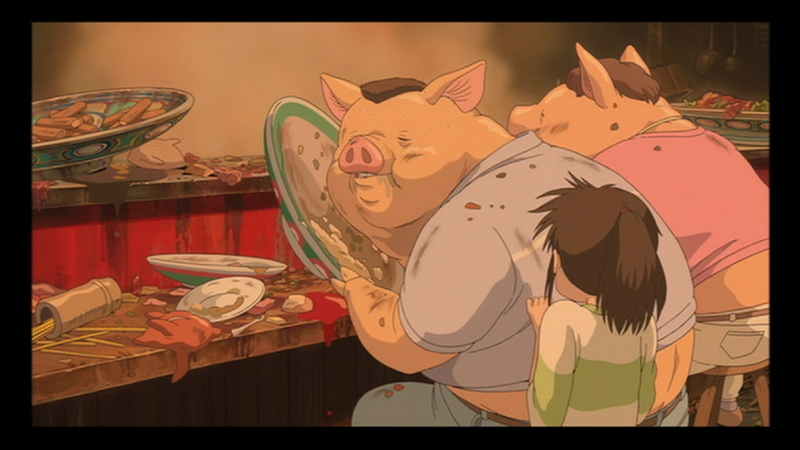 In Spirited Away, Chihiro loses her parents to gluttony—plain and simple. While making a pit stop on a long road trip, the family stumbles upon a spooky, abandoned amusement park. They see mountains of food and dive in headfirst. Here, they stuff their faces with Taiwanese sausages (try Wu Di’s “Flower Lady” Taiwanese sausage); glutinous rice cakes, which on Jiufen are available Hakka-style in sweet or salty preparations with yam fillings, salted vegetables, red beans, or salted green beans; bitter gourd; king mushrooms; and translucent meat dumplings, better recognized as the slimy, jiggly blobs that Chihiro’s dad hoovers (I recommend Jiufen Jinzhi’s red meat dumplings). After trying these snacks for myself in Jiufen, I went straight for the peanut ice cream rolls at A-Zhu Peanut Ice Cream Roll for a first-round dessert. The handheld dessert wrap hails from Yilan, and consists of ground peanut candy, maltose, celery, and taro ice cream wrapped in a handmade spring roll-like skin. It’s crunchy, gummy, cold, hot, savory, and sweet all at once. When Chihiro’s parents turn into pigs, she runs screaming into the eerie streets of Jiufen at night. It’s a literal ghost town. She weaves around ghosts taking evening strolls along Shuqi Road until she meets Haku, who helps her navigate the spirit world in which she’s now trapped. The center of the town, and where she’ll have to be located for the time being, is the bathhouse owned by a crabby and unforgiving witch named Yubaba. The bathhouse is a carbon copy of Jiufen’s grandest building, the 100-year-old Amei Tea House, unmistakable in side-by-side comparisons thanks to the signature rows of red lanterns and the beautiful, soft light that glows from its large glass windows at night. You can follow suit when No-Face and Zeniba (Yubaba’s twin sister) sit down for afternoon tea with cake and confections. The only difference? There are no (visible) ghosts soaking in hot tubs at Amei, or any of the other teahouses dotting the hills of Jiufen. No Face—the film’s cloaked spirit whose ghastly black-transparent body is abbreviated by a harsh white mask-face that’s very Jason Voorhees meets a Mexican luchador—is pure id, ravenous and completely insatiable. At the bathhouse, workers offer him heaps of food. He eats and eats and eats until his body expands and lumps, devouring fish balls, dumplings, snails, whole fish, and whole pigs, along with all kinds of Japanese treats, from tonkatsu (deep-fried pork) to sushi. All of the Taiwanese foods are available at the food stalls. Even the confections, gift-wrapped candies and cakes, that Yubaba’s baby Boh eats are available for visitors to try for themselves. Above all, food is a source of comfort in Spirited Away. Later in the film, it is a magic cake that restores Haku and No-Face back to health. Throughout, Haku warns that Chihiro must keep eating the spirit world’s food, or else she may disappear: eat the food of the place, and become part of that place. Spirited Away is made real in its on-point depiction of Jiufen’s buildings and storefronts. But most of all, the film comes alive through Jiufen’s food. And the best part is that none of it is hard to find, should you venture there yourself. The mysterious mountain city is a vision of perfection—if you can tolerate the crowds and gorge yourself with delicious Taiwanese snacks without turning, like Chihiro’s parents, into a pig.